and by others up to the present time. This topic is continues from the previous essay. "I think case must be that one generation should have as many living as now. To do this and to have as many species in same genus (as is) requires extinction. Thus between A + B the immense gap of relation. C + B the finest gradation. B+D rather greater distinction. Thus genera would be formed. Bearing relation to ancient types with several extinct forms." 1844: 2 An anonymous author published a book in England titled: "Vestiges of the Natural History of Creation." 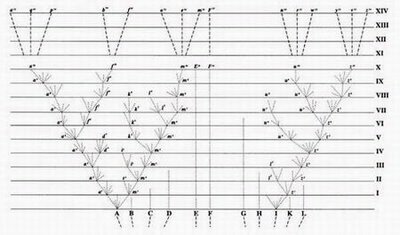 It contained an elementary tree diagram showing how fish (F) first branched from the main evolutionary path at point "A", followed in turn by reptiles (R) and birds (B). The main path continued to produce mammals (M), including humans. 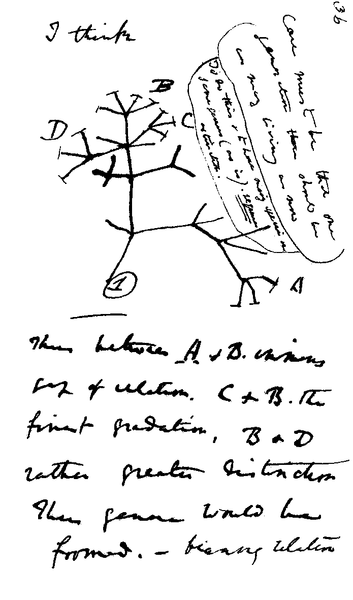 1859: 2 Charles Darwin published his book: "On the Origin of Species by Natural Selection." It included this tree of life as its only image. 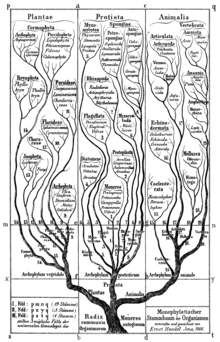 1866: 2 Ernst Haeckel published his version of a tree of life in his book "Generelle Morphologie der Organismen." It shows an early division of life forms into three kingdoms: Plantae (all living and extinct plants), Protista (a collection of about 35 simple life forms that are either single-celled or multicelled without specialized tissues) and Animalia (the animal kingdom). This images was prepared by David M. Hillis, Derrick Zwickl, and Robin Gutell of the University of Texas. Approximately 3,000 species are included. 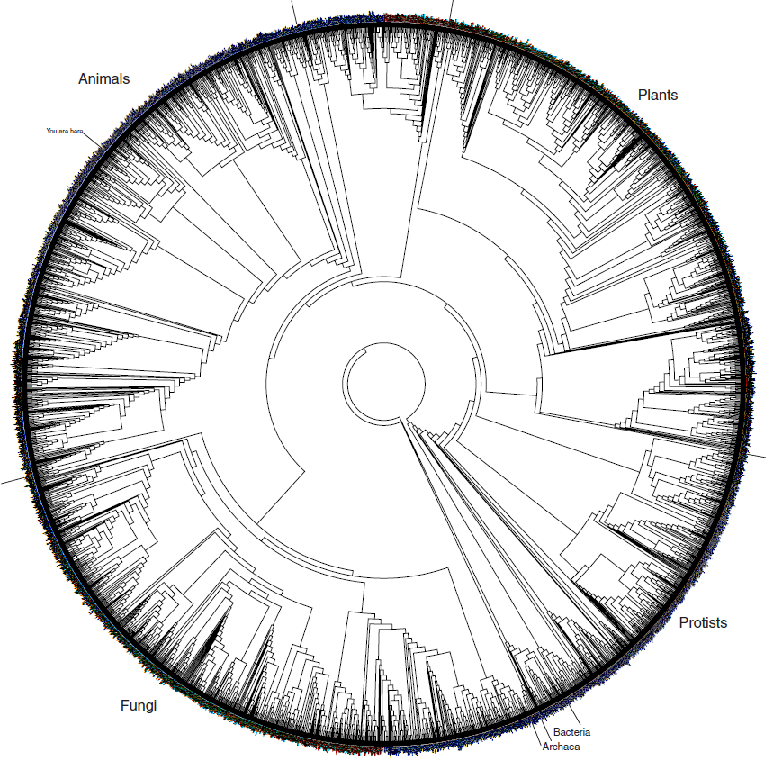 In spite of its obvious complexity, this image includes only a small fraction (0.18%) of the 1.7 million species of life on earth "... that have been formally described and named." Eukaryotes which consist of one or more complex cells with its genetic material embedded in a nucleus. This led to almot 8 million species such as bananas, fruit flies, and humans. 4 People who watch the TV program "The Big Bang Theory" will recall that the character Sheldon Cooper suspects that he is perhaps the first member of a new species, having evolved from ordinary Homo Sapiens but with greatly enhanced intellectual abilities. At about the 2 o'clock position are mammals including everyone reading this web page (unless, of course, some intelligent form of life living in a different planet in another solar system has tapped into the Earth-based Internet). An interactive version of this tree can be found at the Life web site which has much more information available. Copyright © 1999 to 20188 by Ontario Consultants on Religious Tolerance.